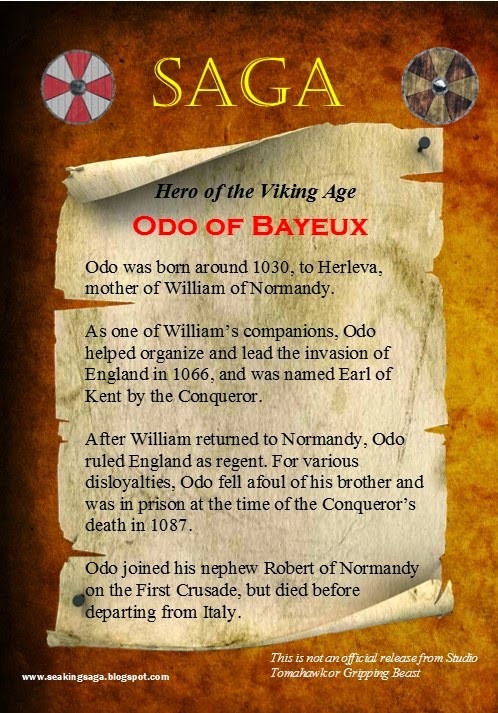 Companion to William the Conqueror, Bishop of Bayeux, Earl of Kent - Odo certainly collected many titles in his sixty-plus years but he his best remembered for the famous Tapestry housed at his bishopric, which he probably commissioned himself. Odo was born around 1030, several years after his half brother, William. Their mother Herleva was not, as many claimed an believe, the daughter of a common tanner, but definitely not from high nobility. After a youthful and unconsecrated relationship with Duke Robert I of Normandy resulted in the birth of William c. 1027, Herleva was married off to Herluin, Vicomte of Conteville. She bore him two sons, Odo and Robert, both of whom later played significant roles in the conquest of England. The date of Odo's birth is unknown, but when he was made bishop of Bayeux in 1049, his age was between 14 and 19. Very young to be sure, but not too surprising for one so well connected. Being a bishop did little to suppress Odo's worldliness and greed, and in fact probably gave license to his corruption. His wealth did allow him to patronize a variety of artistic and architectural endeavors. In 1066 William entrusted Odo with the task of raising ships and supplies. 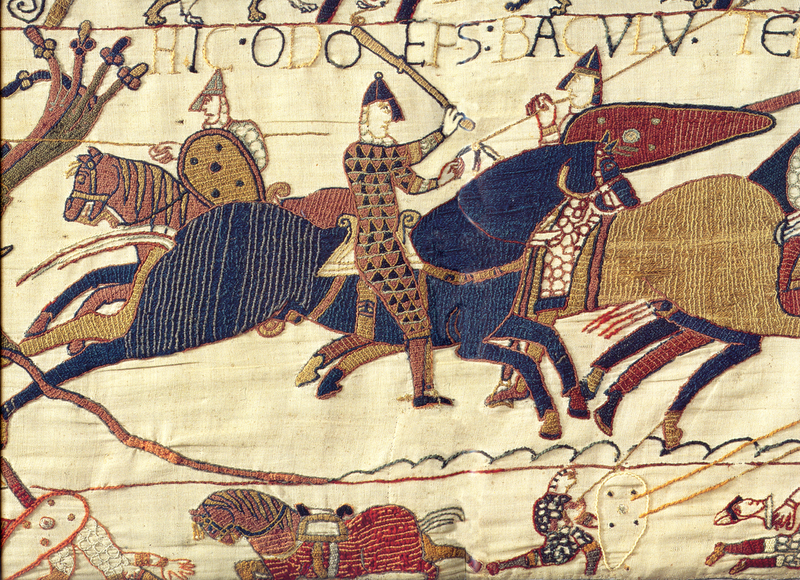 He directed troops in the Battle of Hastings, though he probably did not personally engage in melee. After the conquest, Odo was given numerous estates in England and held the title of Earl of Kent. Afterwards, William spent most of his time in Normandy, leaving Odo as his regent in England. On the Bayeux Tapestry, Odo is depicted wielding a club or mace. Victorian historians attributed this to a supposed ban on religious leaders carrying swords and shedding blood in battle. While early Medieval church reforms discouraged bishops from engaging in battle, no such proscription on swords exist. In truth, Odo's club was a symbol of authority not piety. Undoubtedly, this image and associated stories served as the inspiration for the requirement in Dungeons and Dragons that the Cleric class could only carry blunt weapons - because braining your enemy to death is much more compassionate that stabbing them! Odo spent his later years out of favor with his brother. This was largely Odo's fault, for he was imprisoned for a variety of corruptions and plots. On William's deathbed, the king ordered the release of all his prisoners with the single exception of Odo. William's advisers, specifically their brother Robert, pressed for Odo's freedom and succeeded. even attended Wiliiams funeral. Later, Odo was forced to leave England for plots and remained an advisor to William's son Robert, who inherited Normandy, but not England. He joined his nephew on the First Crusade, but died en route in Italy in 1097. 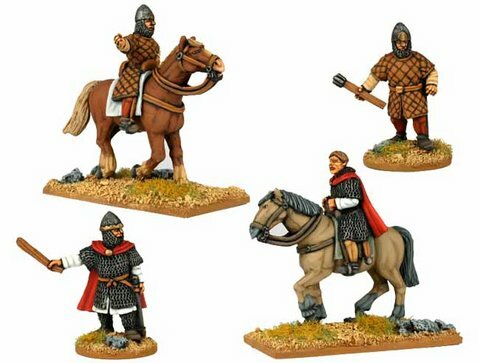 Like William the Conqueror, the top Dark Age manufacturers Crusader and Gripping Beast sell figures for Odo. 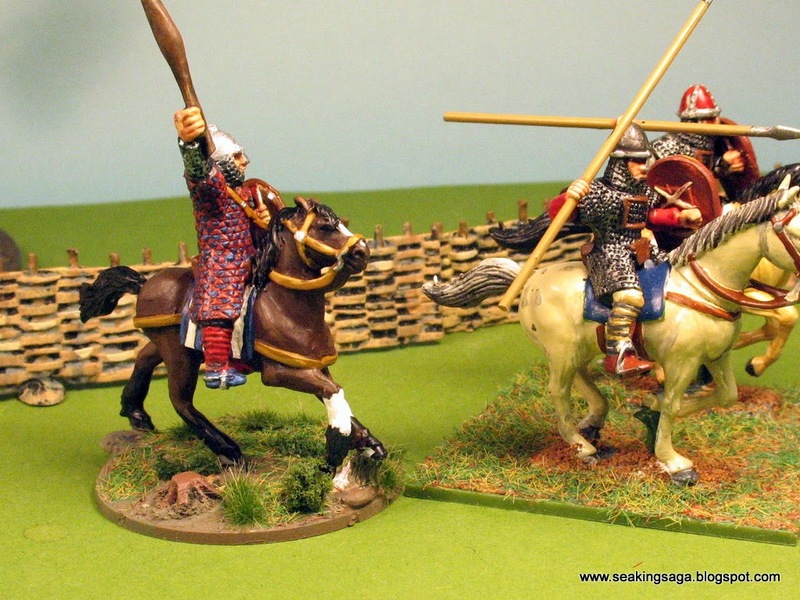 Gripping Beast's mounted Odo is very close to the depiction on the Tapestry with its triangular patterned quilted armor. 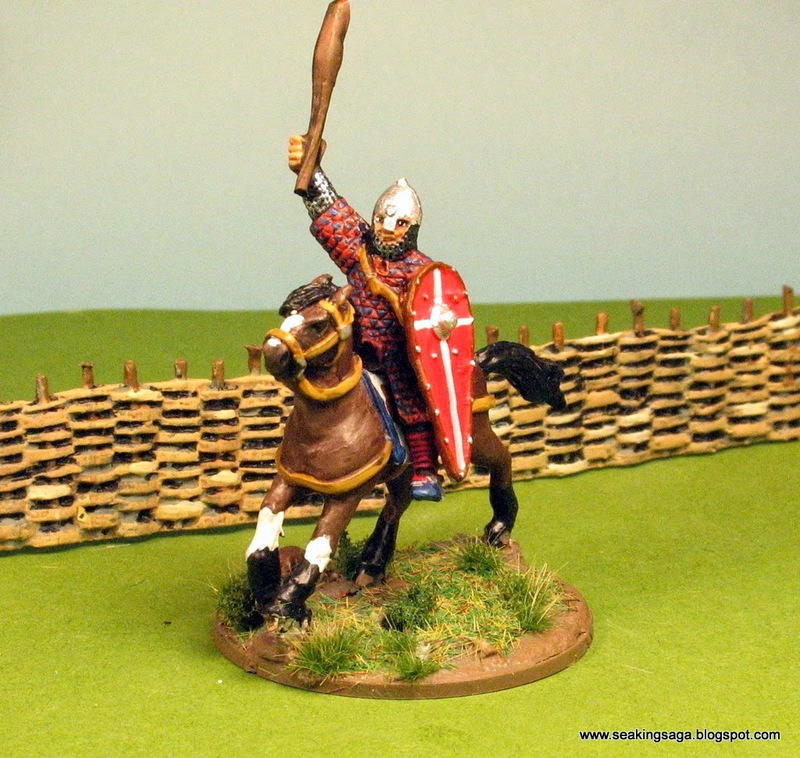 Below, Odo from the other side, leading a pair of Conquest Games plastic Normans. For an Odo on foot, Crusader makes a figure in padded armor. I used one of Gripping Beast's Angry Monks, with chainmail and a sword, indicating a higher ranked official than just a lowly monk. 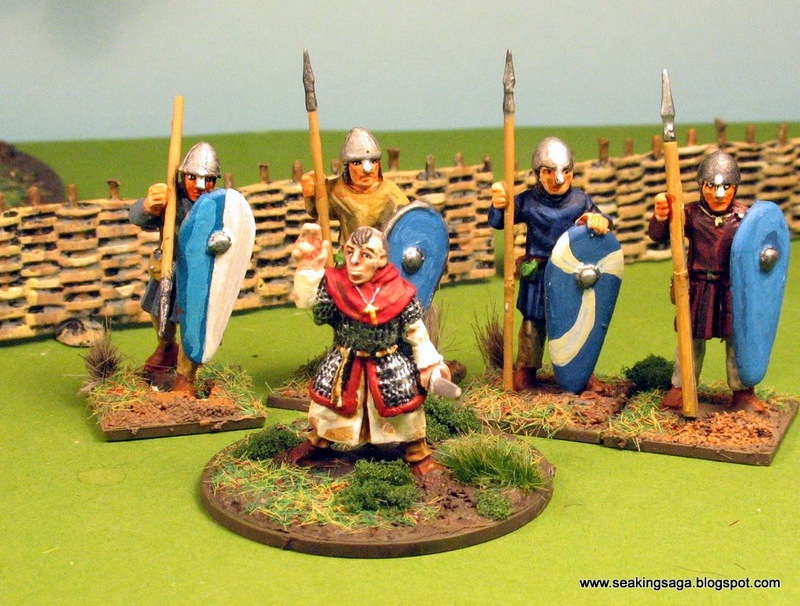 For SAGA, Odo can only lead a Norman warband and may not employ any swords for hire. 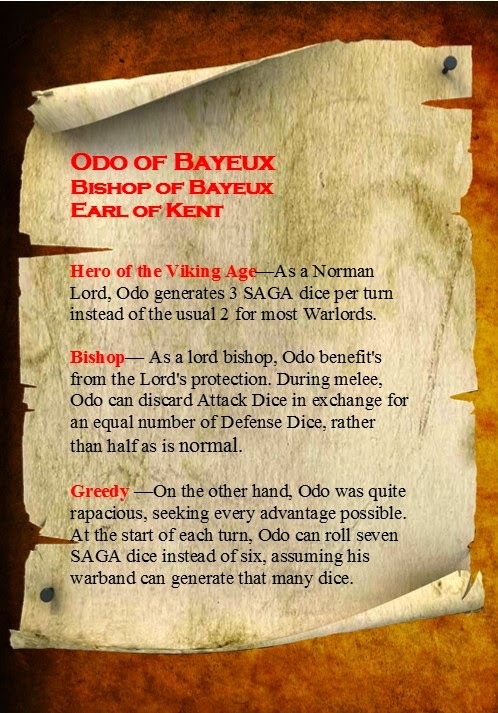 Hero of the Viking Age—As a Norman Lord, Odo generates 3 SAGA dice per turn instead of the usual 2 for most Warlords. 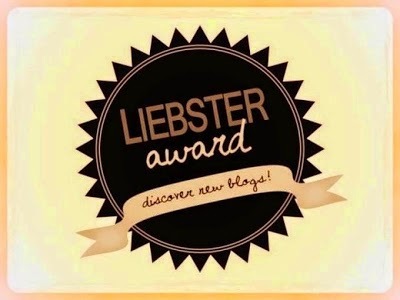 Bishop— As a lord bishop, Odo benefit's from the Lord's protection. During melee, Odo can discard Attack Dice in exchange for an equal number of Defense Dice, rather than half as is normal. Greedy —On the other hand, Odo was quite rapacious, seeking every advantage possible. At the start of each turn, Odo can roll seven SAGA dice instead of six, assuming his warband can generate that many dice. Two of his abilities have been used before for other SAGA heroes, and the Bishop ability was created to emphasize Odo's "lead from the rear" approach. It makes him hard to kill, but less offensive.